I have always loved Point Horror. I used to read them in one sitting as a teenager and recently have re-read several. After seeing some other people on Twitter also still love Point Horror I decided to read & review some for my blog. Please feel free to join in and give your thoughts on favourites from your teens and books from the series you still love today. 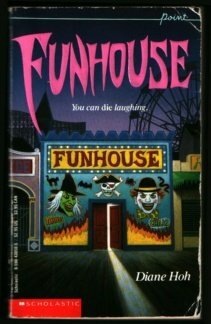 The Funhouse is one of my favourites. When the Devil's Elbow roller coaster goes off track, killing one teenager and maiming two others, everyone thinks it's just an accident . . . except Tess. She saw someone tampering with the track. Then another "accident" occurs in the Funhouse and Tess may have been the intended victim. I loved the extracts from the killer who found an old journal and wants the boardwalk to suffer. I didn't guess the killer till right at the end which is good. I found it a little annoying how all Tess's friends were like its all fine, there's nothing to worry about when clearly something is wrong and why didn't Tess go back to her dad's sooner? Strong, stubborn or stupid? The other thing that struck me was the odd names Doss, Beak and Guy-Joe!!! What?!? It reminded me a little of the film Final Destination and although seemed dated largely due to the clothing/hair descriptions was still a good read. What did you think? Was it a Point Horror you remember? April Fools - Coming home from a forbidden April Fools party, Belinda and her friends witness a horrible accident. When no one appears to have survived, the three friends vow not to admit they were there. Then the sick pranks begin, and Belinda must discover the truth to save their lives! I did enjoy this book but found Hildy and Frank horrible from the beginning and couldn't really understand why Belinda was friends with them and went along with covering up the accident. I also thought Belinda going back to the house repeatedly annoying as she was clearly terrified of Adam. I loved Cobbs although it makes me laugh how Americans view English people! What was with the cream in tea. Does anyone actually do that? I wish we'd seen a little more of Mrs Thorne I think she was a great character and reminded me of Angelica Houston. I didn't guess Noels involvement did you? I joined twitter a little late 12 January 2014. For any new self pubbed authors I would really recommend you get on twitter as soon as possible. My following has increased steadily on twitter whereas Facebook has stalled. I have conversed with more people on twitter than I expected and met a few lovely people. You can search for like minded people by using key words so you can find people that maybe interested in your page i.e.- keywords book/reading/ya/paranormal. The rain pounds on the rooftop waking me. I am warm under the duvet & smile. An icy foot touches mine & I shiver from the cold & lust. Life is nothing now you are gone. I have no strength, no happiness, no love. I pray for the day I do not wake & can join you again. "Wakey wakey sleepy head, its time to get out of bed. The sun is shining high in the sky, lets build a plane & see if we can fly." A bulb flickered. I watched from the shadows as she smoked on the porch step. I should have stopped coming but the grave was already dug. Ennie meenie minie mo, Shall I let you live or let you go? You look so sad you pain me so, I must kill you as you are foe. I jolted awake. Heart racing. A passing cars headlight sent a warm glow over the room. I sighed relaxing but then saw a figure move. I woke only remembering fragments of a dream. A shopping trolley, beer, laughter. I looked outside confused to see a trolley on the lawn. The tarot reader shuddered. She looked up visibly upset. "Do not travel by car today." As I left she grasped my hand. "Promise." Screech! I heard a heart wrenching thud. Everything went quiet & then screaming. It was only after a few seconds I realised it was me. I've also come across #MondayBlogs. This helps your blog post get noticed, meet others in the blogging community and you can stumble across some fab posts. The basics are to share posts, RT others and use the # it is restricted to Mondays and No Book Promo allowed. Update Dec 2014 - other useful # to promote blogs are #ArchiveDay on Saturday's #SundayBlogShare obviously on Sunday's & #wwwblogs on Wednesday's. The final thing is to make lists. Twitter has the function to make lists so you can categorise groups of people. Your twitter following can grow rapidly and you can't possibly read all the tweets. I have 4 lists currently. 1.Authors 2.Helpful & fun bloggers 3. Celebs and 4. Family & friends. I find this method means I can keep up to date with relevant tweets easier and I'm sure I'll add more lists in the future. I hope this helps anyone out there.